There were a lot of feelings tumbling around the move from the house where we had lived for more than thirty years and raised our children. Though fastened on the clear blessings being handed to us at every step, there was still some shock, some grieving, and of course a lot of work. One of my first impulses in coming to live in the new place was to brighten it with flowers. From the living room couch, I loved the white blossoms of a large, early-blooming tree, and the camellia whose branches wrapped around the vestibule window. I bought a striking red begonia with the darkest, veined leaves I had ever seen, and put it in my kitchen window in the sunshine. It was an accent in my new white and red kitchen that reminded me to enjoy my blessings. We had a ton of things to deal with, demanding our attention to the point of exhaustion. I figured out where the small vegetable plot I wanted would go, and walked around the perimeter of the house. There was a currant bush (so they told us) that they cut down considerably before we moved in, and there was something, a bunch of sticks, that was apparently dead farther to the front on that side. Our lease made us responsible for maintaining the property. When we signed the agreement, we had a lawnmower, but when we moved in we didn’t, because we had loaned it to someone and it did not survive the experience. Our weed eater had helpfully been taken by mistake to the dump. This was a problem. At a couple of points a good friend came and mowed the grass for us, but it had been a while. With so much else to do, we mostly ignored that side of the house for the time being. I can be forgiven for not being more aware of what might be there, because there was nothing at issue besides the length of the straggly grass, and we were unable to do anything about that for the moment. 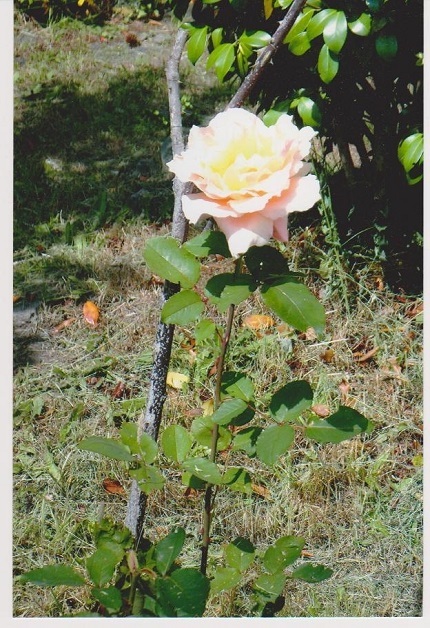 I walked around from that side of the front for some reason one day, and was stunned to find the rose. The mystery bush was not truly dead, only mostly dead, and it was a mystery no longer; here was proof. The mystery bush was a mystery no longer. It sat right in the blind spot of the house — it wasn’t visible from any window. From the other end on that side, the vegetable garden was accessed from the back door, with the overactive currant bush now obscuring the view beyond it. Even walking along the street side, the hedge had kept me from noticing it. You had to walk around the camellia at the front corner deliberately and fight the slant of the ground to get to it. It was beautiful, the more so because it was unanticipated. The flowering trees at this house were beautiful, including the fruit trees from the house behind us, but at ground level the state of the yard was dreary — it could flatten your mood just to walk outside and look at it. That rose made me think about possibilities to make it better. Then a generous friend gave me an unexpected cash gift for my birthday last fall, and I was seized with the idea of growing flowers. Everywhere I went there were displays of bulbs to plant for spring: tulips, daffodils, iris, anemones, all kinds of flowers. Maybe I could make something beautiful happen. She was a gardener; though she assured me that I could do anything I wanted (I knew that) with her gift, I think she’s happy to know that she started something good. Here, we had a new place and a new start. What would work? I bought some inexpensive planter boxes for the front of the house, for two reasons: they could be moved if needed, and I wouldn’t have to be down on the ground on my hands and knees to work on them, with my bad back. I could take out my short stool and sit. What did I want? Fancy daffodils, for sure, and maybe iris. My father wouldn’t grow iris, he told me when I was a kid, because he said they were too ugly when they were dead. I decided that I didn’t care. I’ve always thought they were lovely when they were in bloom, and worth the after-state. 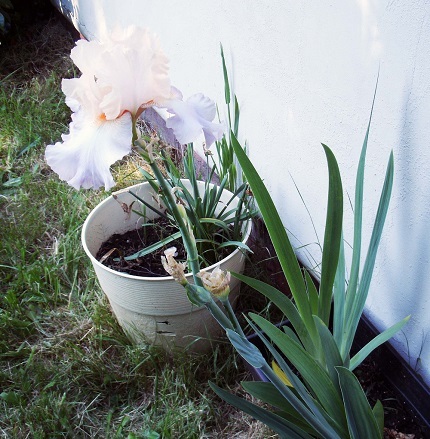 I chose and planted several types of iris in the three long boxes, and daffodils in the round cream colored planter I found on clearance. I started looking at pictures — will it fit, will it grow here, how will it look, will it be able to take care of itself once established. I was caught up in the possibilities. He watered the house plants, I didn’t remember; they were just not in my habit pattern. I had my hands otherwise full. But this wasn’t coming out of a clear blue sky. I had been the sometime gardening helper with my father. I remember how every spring he would pick a day and take us all out to make our choices with annuals, chiefly pansies. Each of us would get to pick a color, and sometimes I agonized over having to choose just one, and made sure that one of my siblings was going to pick the other colors that drew me in. My teenaged younger son and I planted tulips one year, as we plotted a section of bulbs: color, height, and bloom time. The results came out well, but he did the physical work. After various accidents and injuries, gardening was on the list of Things I Can’t Do. I had tabled any impulses in that direction. But it always felt good, actually, to get my hands into the dirt. But life had changed, and I was looking around with a new eye and a desire to make this new home a better place to be. The nest was empty, and the demands on me were lessened. I had run out of children, and it felt good to work on seeing something grow. It still feels good. I think that’s a universal impulse, however it may come into play. Instead of dwelling on our losses, it’s drawn me towards my blessings and lightened my spirit. I put in the iris and daffodils. I fell in love with peonies; my husband said his home had some growing up, so that was a link for him. I was determined to have an azalea that wouldn’t get killed (another story) so I bought a large half-barrel type container for the back yard and ordered a gold-colored variety developed in Minnesota because I figured the winters here would be no threat for it, and in that tub no one could mow it down by mistake. I decided that there was a spot that would fit a lilac in the back corner away from the street. When you get a lilac for eight dollars, it’s just a baby. I didn’t have money to burn in this quest. I hoped it would grow more than it has this year, but it’s healthy. What can I say? It’s probably the visual environment I grew up in, full of art. I was envisioning that golden azalea on the other side and the white clematis (another plant that’s new to me) behind it. I wanted to enliven that corner. If there were room for more than one, I might have chosen a white and a deep purple. There’s not enough room for everything I would love to have. Now I just want the one I chose to grow. They tell us not to go grocery shopping when we’re hungry. Perhaps we shouldn’t be turned loose for the first time to shop for a garden in the burgeoning springtime; on the other hand, it can be pretty fun. How have things turned out? There have been some mishaps along the way. The deep pink peony I bought for the front, as a bare root, made it through the winter and started to grow nicely. Then we accidently lost most of it when a ward scout and his dad came with a weed whacker to attack the grass outside the hedges and said they had time to do the small section inside the front. It was later than I expected, and it had become dark. I said that the plantings were in containers, and, assured that they had enough light, they began — and I ran out, as I realized that I had forgotten about the peony. Too late, my fault. Four months of growing was gone, but it wasn’t killed. (There’s a white one in the back, too.) It should come back. Most of the daffodils came up. The iris in the boxes gave us five plants with only leaves, and one that bloomed. I was puzzled when I saw it, and said that I didn’t remember choosing anything quite that pale. My husband said, “I think it’s pretty; in fact, I think it’s the most beautiful iris I’ve ever seen.” All right then, we’re happy. The most beautiful iris my husband has ever seen. One of my planter boxes grew nothing at all. I waited for the season to end, and then went out and dug carefully around. Nothing is in it; I presume that squirrels dug the bulbs up and ate them. It had some daffodils, and I think those are particularly tempting to the furry critters. In fact, as I take inventory of the flower efforts, there are more “next year” items than immediate successes. I am not daunted. I have tulips for spring and a small number of carpet lilies for summer on order, and the spaces planned for them, to put in the ground and anticipate through the winter. This has been a process of joy to me. It would not have been possible without that birthday gift and without another friend who genuinely likes to dig into the dirt, and has given me physical assistance, because my desires outreached my capabilities. I want to thank them both. My first baby’s first t-shirt was a rebus (pictograph) graphic that said, I grow (tomatoes) and (carrots) and (corn) and (radishes) and (cucumbers) and (peas) and (flowers) too. The flowers go all the way across the width of the design with a wavy ‘dirt’ line and an assortment of flower shapes and colors. It sums things up nicely. More than once, I have heard LeGrand Richards quoted as saying to a bride and groom, if you have only two pennies, spend one for bread and one for flowers. Buy the physical necessities of life, but remember what the heart and spirit need as well. My spirit needed this, and I didn’t even know it.